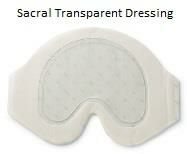 Transparent dressings are made up of a thin transparent sheet that allows for easy inspection of the wound bed. It allows you to check the healing progress and the amount of wound drainage. 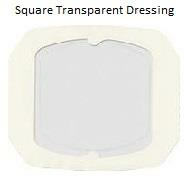 Transparent film dressings protect the skin at pressure spots and keeps the affected area moist for faster healing. Its flexibility allows it to conform to the wounds that are in hard to cover locations of the body. 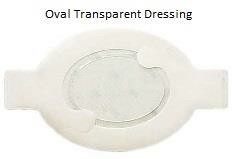 Transparent dressings come in a wide variety of sizes and shapes to cover different types of wounds. Transparent wound dressings works as a primary dressings and helps in covering second stage wounds, partial thickness wounds or wounds with little or no drainage. No secondary dressing is required to cover this dressing. Transparent dressing can also be used as a secondary dressing over a gauze dressing to secure it in place. This type of dressing should not be used on wounds which require daily or frequent dressing changes. To meet the requirements of different types of wounds, transparent film dressings are available in a variety of shapes and sizes. Based on the shape of the wound, a rectangle dressing might be needed instead of a square one, or you might need something that is round or slightly curved. A dressing with fenestration for needle works best if you want to affix IVs or tubings to the skin. Also, some of the transparent dressings have an area to write the time and date to keep a track of when the dressing was last changed. Among the varieties available, the size of the dressing should be chosen in such a way that there are one to two inches between the adhesive border and the wound. How to Use a Transparent Film Dressing? Use a normal saline solution to clean the wound. Pat dry the skin around the wound with the help of a gauze pad. Remove the liner from the transparent film dressing and expose the adhesive surface. Locate the wound through the transparent film and hold the dressing over its center. Dressing should be large enough to leave at least a border of 1-inch around the wound. Gently apply the dressing over the wound surface without stretching it. Smoothen out the dressing from center to outwards. To remove the dressing, lift it from the edges towards the center slowly and carefully to prevent the stripping of epidermal tissues. The transparent dressing should be changed within 3 to 5 days. It can even be left on the wound for up to 7 days. If the dressing becomes loose, if there is leakage or you notice some skin irritation or redness, remove the dressing and reassess whether its use should be continued or not.